It’s easy to get caught up in the physical practice of yoga. With so much pressure coming from social media, sometimes it seems like yoga is just about doing crazy postures. The truth is that yoga is a living system. It’s about treating yourself and others well. It’s about learning compassion. It teaches us that to get where we want, hard work is required. Somewhere along our yoga journey, some of us have gotten caught up in “what’s the hardest thing I can do?” I know plenty of people that can do amazing things in their bodies, but when it comes to being good humans, they lack integrity. Ego gets in the way. The ego isn’t always the bad guy, but it often times goes unchecked and people get carried away with it. 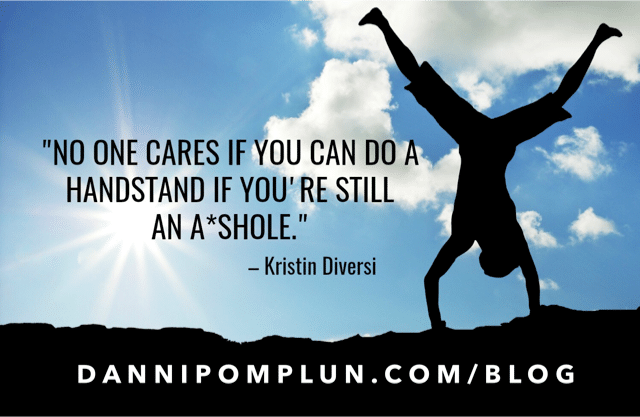 Kudos to you if your handstand is great, but be sure to back the external with the internal. I may not hold a perfect handstand this lifetime, but I sure as hell will hold some space for those who truly need it.